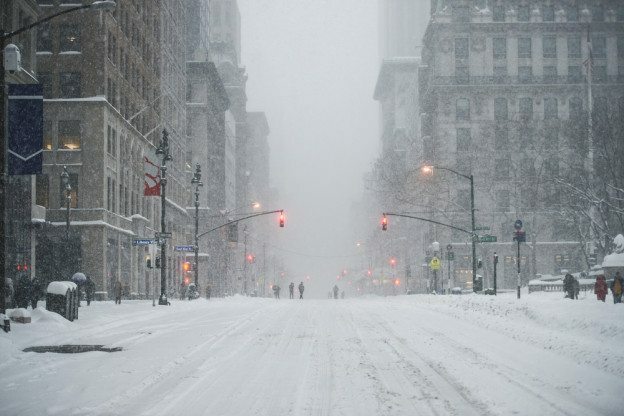 It’s been a few weeks since New Yorkers experienced their first real snow fall of the year, but the late winter snow surfaced an important conversation about the ice and snow accumulation and how it can create a slip and fall hazard. The snow may be gone now, and yet with Punxsutawney Phil predicting 6 more weeks of winter, it is important for we New Yorkers to stay aware of potential slip and fall hazards, and learn about what we need to do if we fall victim to these dangerous weather conditions. A slip or a fall can lead to serious injuries like broken bones, traumatic brain injury, spinal cord injury, and deep cuts. In some cases, these injuries have severe complications, like paralysis and blood loss. Injuries sustained in slip and fall accidents can saddle victims with substantial expenses. Aside from the immediate expenses like medical bills, victims can be forced to take long periods of time off work to recover and even have to stop working altogether. Losing independence and going into debt by suffering an injury because another party failed to clear the ice or snow from his or her property is not fair to the victim. To make up for this debt and decrease in quality of life, a victim can seek compensation for his or her damages through a personal injury claim. ● Sidewalks. An ice or snow-covered sidewalk can be difficult to navigate, particularly when the ice or snow covers hazards like raised tree roots and broken pavement. Who is Liable for my Damages if I am Injured in an Ice or Snow-related Fall? The owner of the building or property where your injury occurred is liable for your damages. If your accident occurred on the sidewalk, the owner of the building adjacent to the stretch of sidewalk where it occurred may be held liable for your damages. In the winter, property owners have the responsibility to shovel snow away as it accumulates and put ice on sidewalks and stairways to prevent ice and snow accumulation. If a property owner knew about a hazard and did not act appropriately to remove that hazard, he or she was negligent. Through your premises liability claim, you must demonstrate that the property owner was negligent and that as a direct result of this negligence, you suffered a specific injury and its accompanying specific damages. If your accident occurred on a government-maintained property, such as a public concourse or a park, you may file a premises liability claim against the responsible government agency. The process for filing a claim against the government is a bit different from filing one against a private party. For a personal injury claim involving a private property owner, the statute of limitations is generally three years from the date of the accident. If the claim is against the government, you must notify the negligent agency of your intent within 90 days of the accident, then file the claim within one year and 90 days of its occurrence. If you can stand up, do so. If you do not feel like you can stand without hurting yourself or falling again, remain where you are and call for help. Take as many photographs of your injury, the accumulated ice or snow, and the area where the fall occurred as you feel are necessary to communicate what happened. These photographs will be important pieces of evidence to use later to support your claim. Try to locate the owner of the building or another party who can help you find this individual. You should file an accident report with the owner of the property documenting the exact time, date, and details of your fall. This, too, will be an important piece of evidence to support your claim later. Take down the building owner’s contact and insurance information. If there were any witnesses to the accident, take down their contact information as well. They may need to provide testimonies later to support your claim. As soon as you can after the fall, seek medical attention. Discuss the incident in thorough detail with your doctor so he or she can accurately diagnose your injury and determine an effective treatment plan. Do not leave out any details – sometimes, injuries that appear to be minor or even nonexistent can become severe and painful if they are left untreated. Follow your doctor’s instructions for a fully, healthy recovery. If you do not take care to help yourself recover, you can invalidate your claim or drastically reduce the amount of compensation you are entitled to receive. This is known as your duty to mitigate your damages. During the winter months, New York and other northeastern cities can become icy danger zones. When a property owner does not uphold his or her duty to prevent accidents by clearing ice and snow from their property, victims can fall and suffer severe injuries. After you have received appropriate medical attention for your injury, contact an experienced Brooklyn personal injury attorney to discuss your rights and how you can move forward in your pursuit of compensation for your damages. To learn more, contact The Law Offices of Jeffrey K. Kestenbaum today at (718)-237-5586 to set up your initial consultation with us. During your consultation, we can identify the party responsible for your injury and how you can gather the necessary evidence to support your claim. This entry was posted in Brooklyn Premise Liability Lawyer and tagged Brooklyn Premise Liability Lawyer on February 27, 2017 by Jeffrey K. Kestenbaum. Nice information last month one of my friend fell in front of mall and got her hand fractured in it, and she has absolutely no clue on what to do next and who is liable for her situation. This article will definitely help her.